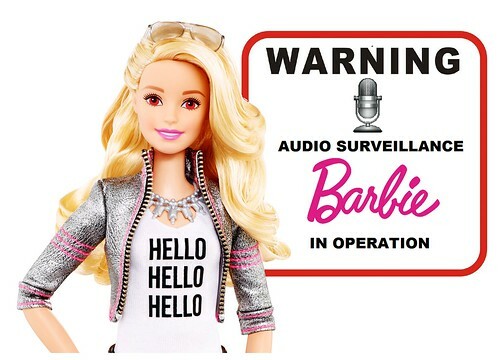 Can Hackers Hijack Wi-Fi Barbie Doll to Spy On Your Kids? The Mattel corporation has introduced the Hello Barbie ™ interactive doll that not only talks, it listens. And records your kid’s conversation with her. And connects to Wi-Fi so her recordings can be analyzed by the ToyTalk ™ voice-recognition software, and the information shared with parents or … who knows. What could possibly go wrong? Plenty, say Matt Jakubowski of LookingGlass Cyber Solutions and Andrew Browne of Lavasoft’s malware lab. Like Wi-Fi baby monitors, the dolls can be hacked by 3rd parties, and we’re not talking about Barbie’s Princess Tea Parties here, but persons of bad intent. ToyTalk says that’s not so, that Barbie’s software cannot be hacked. Frankly, we will reserve judgement until we can ask Hello Barbie ™ about this in person. The Mattel corporation has introduced the Hello Barbie ™ interactive doll that not only talks, it listens. And records your kid’s conversation with her. And connects to WiFi so her recordings can be analyzed by the ToyTalk ™ voice-recognition software and the information shared with parents or … who knows. What could possibly go wrong? So now girls will have a role model of anatomically impossible proportions who will teach them fashion consumerism and will eavesdrop on them, too. Talk about your multi-tasking. Welcome to the 21st Century, female offspring!